McAfee, among the leading Internet security companies, releases its latest study — the second installment to the State of Search Engine Safety which reveals that search engine use is, ultimately, still risky. While there is about 1% decline to the dangers of using search engines, web searchers are still predominantly exposed to various threats brought about by sites that are associated with spams, viruses and trojans, and unsecured downloads. Interestingly, risky sites that are referred to by paid listings are 2.4 times as many as those referred by organic search, with categories related to music and technology as being the most dangerous search key terms. 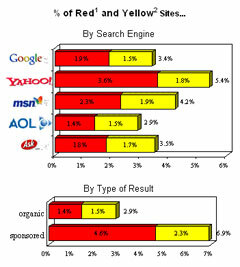 Among the five major search engines, AOL proves to be the safest with only 2.9% of its search results tagged as risky. This is closely followed by Google at 3.4% and Ask.com at 3.5%. Apparently, Yahoo search is riskiest, having about 5.4% of its search results fail the test.